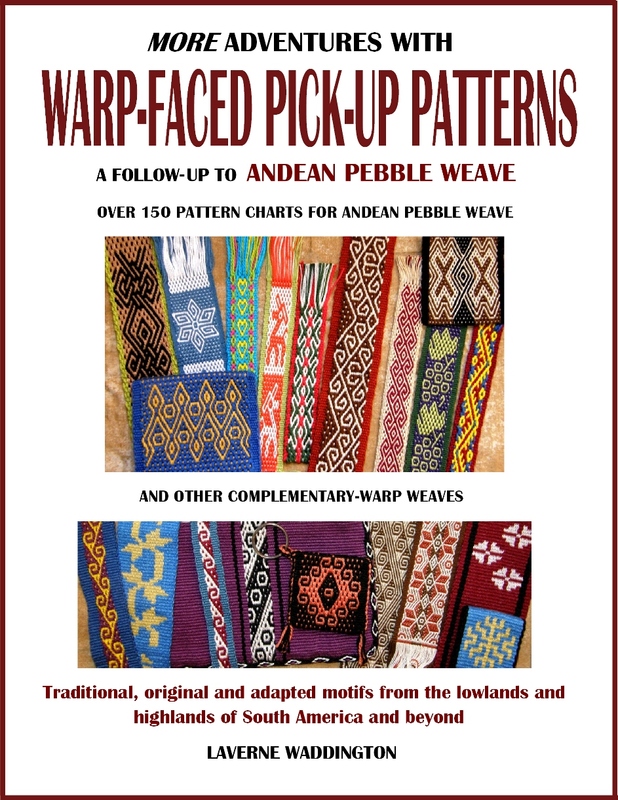 I have brought a couple of videos on simple warp float technique over here from my Flickr page which show how to weave the lower of the two triangles at left. There is a full tutorial on this technique on this page. These videos supplement those instructions. 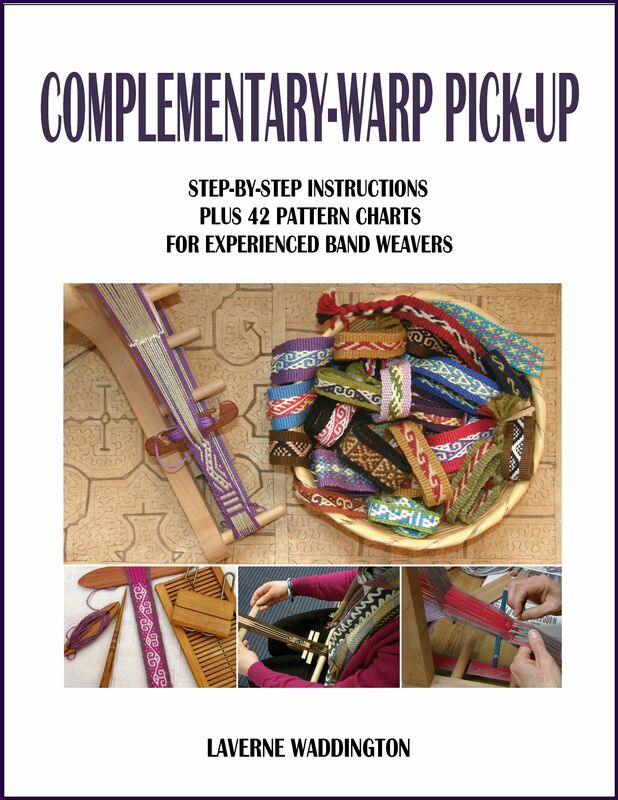 In the videos I am weaving the triangle shown above and show how to float the first three pairs of warps – pairs 1, 3 and 5. The second part of the video shows how to float the second set of warps – pairs 2 and 4. Can you make a video of how to wrap it ? Hi Desmond. For this technique you need to make a warp with the two colors separated into two sheds so that when you weave you create a band of horizontal stripes. Then you can float one of the two colors and make designs. Look for the title Horizontal Stripes on that page and then follow the diagrams and pictures and links. I am trying to follow this tutorial but without success. I am able to weave horizontal bars easily so I think I have my warp set up correctly. It seems like every time I try this I end up erasing the substituted color with the background color on the surface. There are strange things going on with tension and I see odd long floats on the back surface but the from always comes up as alternating horizontal bars in my two warp colors. 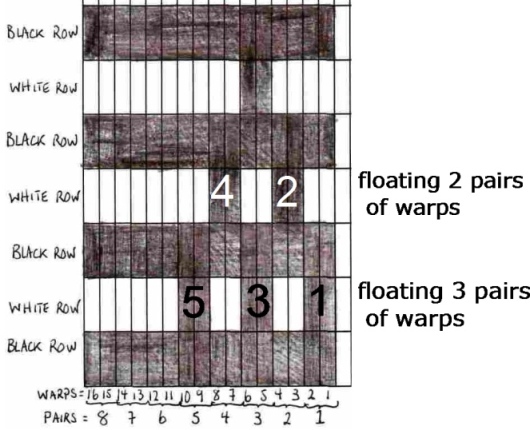 I noticed in another tutorial that you achieve the horizontal bars with a different warp by not separating the colors and placing each 2-color pair of warps in a single heddle. This seems to make more sense to me. Am I missing something? PS I became inspired to try weaving for the first time after a visit to Peru. 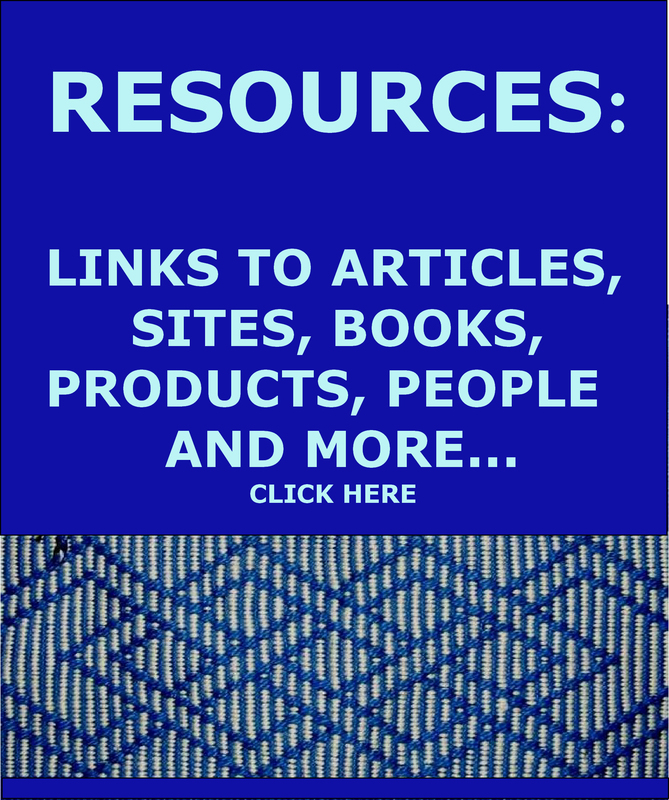 Your site in the best reference that I have found for backstrap weaving. Lacking a real teacher in my area, your posts are life savers! Thank you so much. If you are achieving horizontal bars, that is already a good start. As for making patterns with simple warp floats, it might help if you don’t think that you are “substituting” colors because you are not. You are simply adding threads in one color to the shed that holds the other color. 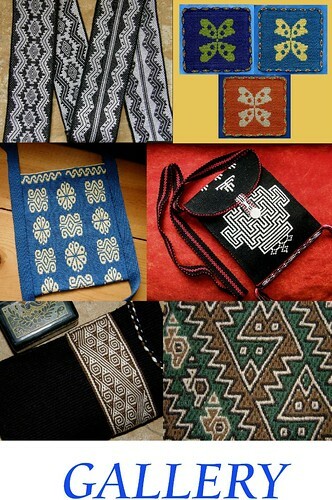 For example, if you want a black float pattern on a background of black and white horizontal bars….you pass your weft through the shed of black. Then you select the black threads that you want to have floating and reserve them on a stick. What you then need to do is add those reserved black threads to the white shed. In order to do that, you open the white shed and then create a shed that comprises all the white threads PLUS the black ones that you reserved. I show you how to do that in the video. Beat and pass the weft. Then open the black shed, beat and pass the weft. As for the back of the band, there will be a hole created in the black stripe because some of the threads from that black stripe have been removed and added to the white shed. You will be able to see your weft exposed in the hole on the back face of the band. There is another way to do this that you might find easier (recommended only for narrow bands)….1. Open the black shed, beat and pass your weft. 2. Open the white shed and beat. 3. Reach down below and pick up the black threads that you want to have floating for the pattern and include them in the white shed. 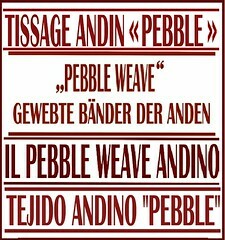 Pass the weft. 4. Back to step 1..Open the black shed, beat and pass the weft. I think you may be looking at too many tutorials and perhaps getting a bit confused. The tutorial in which I have pairs of colored threads heddled together is for warp substitution and double weave. This a completely different technique that does not create floats of warp.